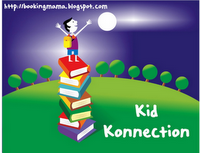 This is the fifth book in Tundra's Great Idea series, and the second one of this series we read by Monica Kulling. The first one that we really enjoyed was Going Up! Elisha Otis's Trip to the Top (read our review). Once again we weren't disappointed by this author's work. She brings to life the story of Guglielmo Marconi, the father of wireless communication. My son said he liked the book because he learned something new. We discussed how grateful we are for Marconi's diligence in pursuing wireless communication because today we benefit from cellphones and wireless Internet. It made my son appreciate just how useful the invention of the wireless telegraph became. 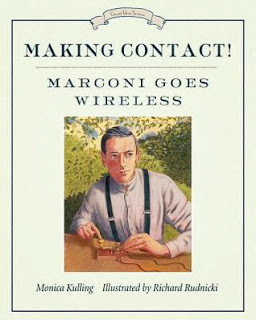 The fact that he has access to so much from his ipod is in part because of Marconi's ideas and invention. Kulling has a way of telling the historical biography of a famous person without overwhelming the young reader. She brings up events from childhood to adulthood in the life of the non-fictional character that would appeal to a child. The following excerpt shows the fun way she introduces Marconi, which we thought funny. “He will be able to hear the still, small voices in the air,” replied Signora Marconi proudly. My son and I liked the colors of the illustrations. The scenes depicting the villa, mountains and vineyards of Bologna, Italy were especially attractive. My son remarked that he did not like the faces of the characters, though. He was not crazy about the style of the illustrator. As I mentioned in my last review of this series, this is a great series to have in a school or personal library as a good way to introduce history to young readers. Disclosure: Thanks to the author and Tundra Books for sending us this book for review. We were not compensated in any other way, nor told how to rate or review this product.